From the trailers, Gringo looked pretty good. With the premise and the action and the funny moments, it was set to be a fun, action filled comedy of drug dealers and out of place white collar characters. Instead, Gringo was a movie that didn’t know what it wanted to be, and failed to deliver. The main plot of the story centers around Harold, played by David Oyelowo. Slowly but surely, his life is falling apart. His wife is spending all of his money and has put him in dept, there’s rumors that he’s going to lose his job, and things just get worse and worse. The trailers don’t reveal a lot of the plot points, as there’s some misdirection, but eventually the cartel does get involved and there is some kidnapping, car chases and shooting. There’s a strong cast of characters, and all of the acting is great, but the big problem with the movie is the direction of the story. On one hand, it’s a great story about how nice people finish last. Harold plays by the rules, works hard, and is a nice person, but he doesn’t get any of the rewards. Instead, all of the greedy, selfish people around him get the good life. As the movie plays out, he gets an opportunity to change things. If this movie were done with a serious tone, it could have been a touching character journey. Instead, it tries to dip its toes into the realm of comedy. And that’s where it goes wrong. 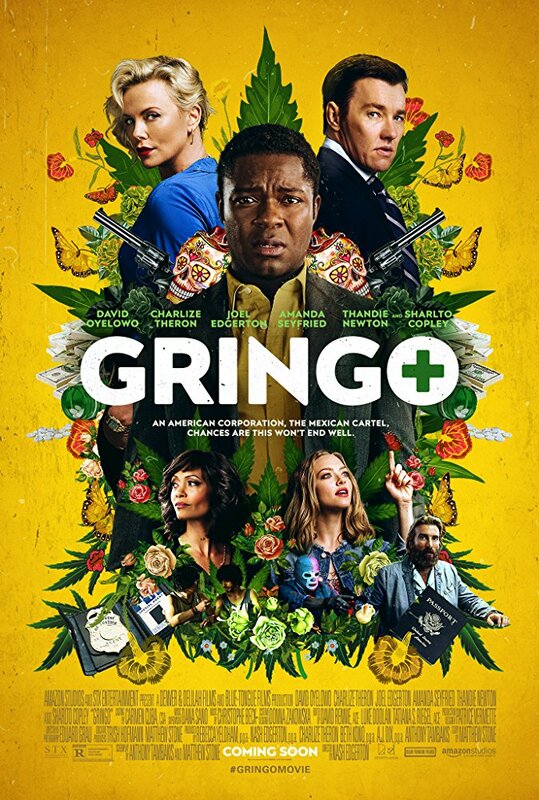 Gringo has the ingredients for a good comedy. There is the bizarre situation of a guy in Mexico working for a company that makes weed pills getting in trouble with a drug cartel and having some mercenary sent to save him all the while trying to stay alive through strokes of luck. The characters are all in the right positions to be funny. There’s the over the top cartel boss who is obsessed with The Beatles, there’s the mercenary who wants to turn a new leaf and help people out instead of killing them, and there’s the pompous greedy boss at the top of the corporate ladder. The issue is they forgot to include the humor. There are no jokes. The movie goes by, things happen, the story develops, but the laughs never come. The situational humor implied in the trailer never pans out in the movie. It’s like they wrote a serious movie, and someone had the idea to turn it into a comedy, but they forgot what they were doing and didn’t finish the job. Here’s the interesting thing. The movie is directed by Joel Edgerton’s brother, Nash Edgerton, who doesn’t have much directing experience under his belt when it comes to full length movies. One of the writers, Anthony Tambakis, has done some great serious work. The other writer, Matthew Stone, has done some so-so comedies. I’m not sure how the project went down, but it feels like there was a bad mix of creatives on this one that turned out a weak film. Bottom line: no matter how big of a fan you might be of some of the actors in this film, skip it. Don’t waste your money to see this on the big screen. This is definitely one that can wait for Netflix. I give it a two and a half bikinis out of five.